Communal celebrations are held several times a year. Baptism and Beyond sessions are for parents of infants. 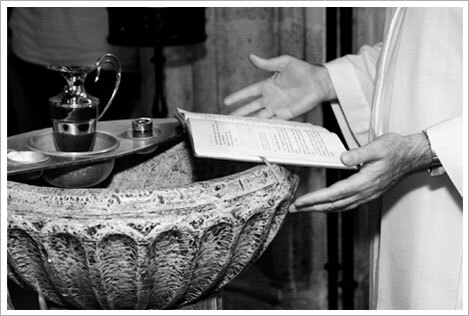 Baptisms of adults and children (age 7 and older) are celebrated in the spring. Christian Initiation sessions (RCIA) are for adults and youth. Saturdays, 3:45 pm -4:30 pm. A Parish Reconciliation service is celebrated twice yearly in preparation for Christmas and Easter. School year long program for grades 2-3, we explore the meaning of rituals, symbols, gestures, and prayers to prepare our children for the Sacraments of Reconciliation and Eucharist. The program is designed to touch the heart as well as the head, engaging children using story, Scripture, doctrine and prayer. Classes meet on Tuesdays, 4:30 pm - 5:45 pm or 6:30 pm - 7:45 pm, September - May. Adult preparation for the Sacrament of Confirmation takes place annually in the fall. The Sacrament is celebrated in January/February at the parish. If you would like to participate, or have a special circumstance or questions, contact Sondra Sciola at sondra@stjude-redmond.org. In an emergency, please call the Parish Office anytime, day or night, 425-883-7685. In other situations, the pastor will be happy to arrange for the anointing as appropriate. A Communal Celebration is held twice yearly as announced. To schedule a funeral, please call the church office at 425-883-7685 during our regular business hours. For the selection of funeral readings, please click here.